There is a strong interest in the investigation of extremely low frequency Electromagnetic Fields (EMF) in the clinic. While evidence about anticancer effects exists, the mechanism explaining this effect is still unknown. 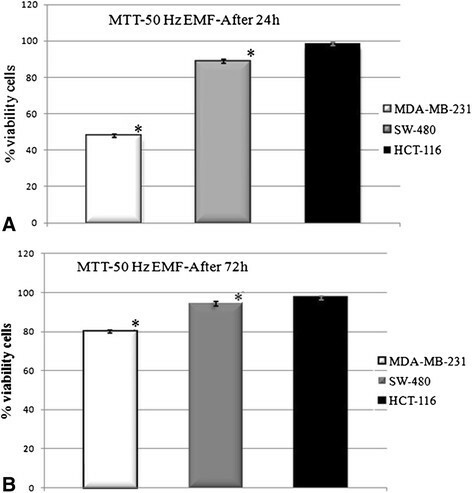 We investigated in vitro, and with computer simulation, the influence of a 50 Hz EMF on three cancer cell lines: breast cancer MDA-MB-231, and colon cancer SW-480 and HCT-116. 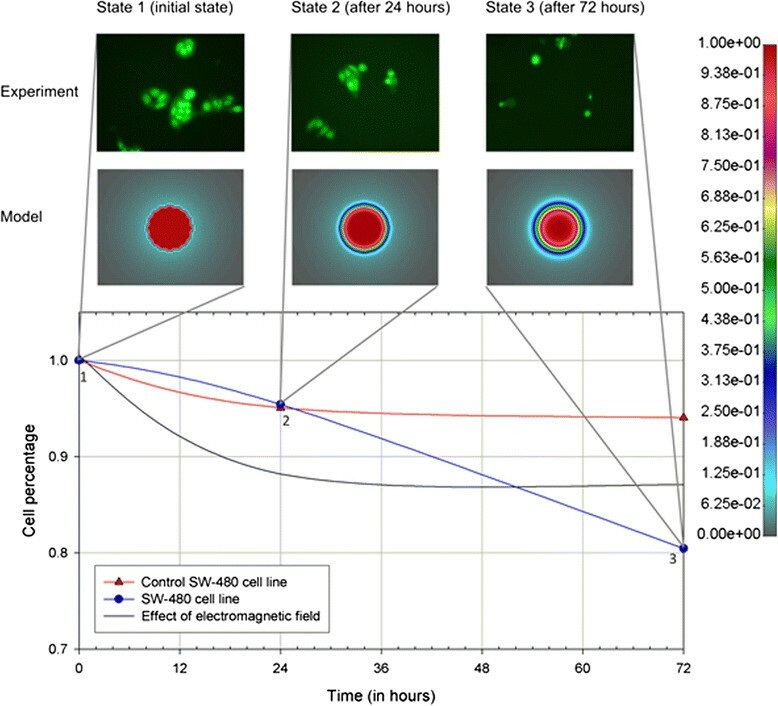 After 24 h preincubation, cells were exposed to 50 Hz extremely low frequency (ELF) radiofrequency EMF using in vitro exposure systems for 24 and 72 h. A computer reaction-diffusion model with the net rate of cell proliferation and effect of EMF in time was developed. The fitting procedure for estimation of the computer model parameters was implemented. Experimental results clearly showed disintegration of cells treated with a 50 Hz EMF, compared to untreated control cells. A large percentage of treated cells resulted in increased early apoptosis after 24 h and 72 h, compared to the controls. Computer model have shown good comparison with experimental data. Using EMF at specific frequencies may represent a new approach in controlling the growth of cancer cells, while computer modelling could be used to predict such effects and make optimisation for complex experimental design. Further studies are required before testing this approach in humans. Alternating electric fields have shown a wide range of effects on living tissues. Depending on frequencies, their activity ranged from stimulating excitable tissues such as nerve, muscle or heart ,, through stimulating bone growth and accelerating fracture healing  to using it for diathermy and radiofrequency tumour ablation . Intermediate-frequency electric fields (>10 KHz to MHz) were mostly considered as having no overt biological effect  and, hence, medical application, though several non-thermal cellular effects have been observed –. The last decade also brought a number of in vitro and in vivo studies which documented the anticancer effects of alternating electric fields –, including low-intensity intermediate frequency (100-300 KHz) alternating electric fields, as well as amplitude-modulated electromagnetic fields (EMF) of somewhat lower frequencies (0.1 Hz to 114 KHz) . As recently summarized  Zimmermann, 2013), these studies showed that anticancer effects were achieved at specific (for the cancer cell type) modulation frequencies and demonstrated proliferative inhibition and mitotic spindle disruption following exposure to alternating electric fields ,. Furthermore, bridging important aspects of apoptosis , with extremely low frequency (ELF) pulsed-gradient magnetic fields, Zhang et al showed that the latter can not only induce it, but may also block the development of neovascularization required for tumour supply. Harris et al  have been shown that ELF might be capable of exacerbating an inherent or induced genetic instability by reducing or attenuating the stringency of the late-cycle (G2) checkpoint. Cameron et al  found that mice received either gamma irradiation IR or EMF therapy had significantly fewer lung metastatic sites and slower tumor growth than did untreated mice. Also they did not find harmful side effects with EMF. Initial clinical results in various tumour entities/sites (recurrent glioblastoma multiforme, hepatocellular carcinomas, breast carcinomas) were encouraging ,,. On the other side, computer models have the common aim of predicting certain features of tumour growth in the hope of finding new ways to combat cancer. The golden aim of computer modelling is to create a model which yields reproducible and accurate predictions, the effects of different genetic, epigenetic and environmental changes, as well as the impact of therapeutically targeting different aspects of the tumour. In order to make a clinically relevant cancer simulation tool that accurately predicts in vivo tumour growth dynamics, shape and spread throughout an organ, computational models must consider the location of a tumour within the organ, and the physical constraints placed on growth by that organ. Treatment plans based on the use of such computer modelling and simulation processes will require rigorous validation studies and regulatory approvals before integration into the clinical practice . Based on these premises, we investigated the influence of EMF at specific frequencies on three cell lines in an in vitro setting. 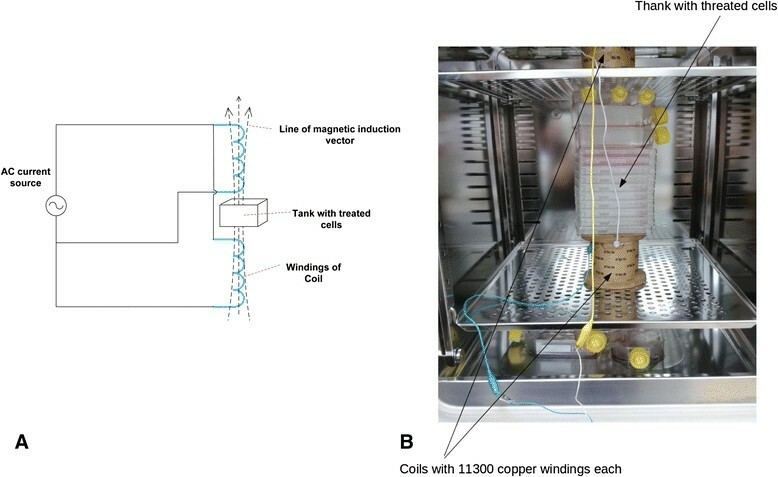 The experiment is performed using the two coils with 11300 copper windings each. The coils are appointed in vertical position and connected in parallel to the alternate current source as it has been shown in the Figure 1A,B. According to right hand screw rule the achieved connection enable superposition of magnetic field from both coils and maximum intensity in the center between coils. (A) Scheme of experiment, (B) Experimental setup. The VC2002 function signal generator is used with output voltage of 9.1 V peak to peak values and frequency of 50 Hz and current amplifier up to 1A. The applied field is with frequency of 50 Hz with RMS value of 10 mT. Environmental background magnetic field is several μT order so it can be neglected. The breast cancer cell line, MDA-MB-231, and colon cancer cell lines, SW480 and HCT-116, were obtained from the American Tissue Culture Collection (Manassas, VA, USA). Cells were propagated and maintained in Dulbecco’s Modified Eagle Medium (DMEM), (Gibco, USA), supplemented with 10% foetal bovine serum (PAA) and antibiotics (100 IU/mL penicillin and 100 μg/mL streptomycin). Cells were grown in 75 cm2 culture flasks containing 15 ml DMEM. After a few passages cells were seeded in a 96-well plate (104 cells per well) and cultured in a humidified atmosphere of 5% CO2 at 37°C. All studies used cells at 70 to 80% confluence. Cell viability was determined by MTT assay . After 24 h incubation cells were exposed to 50 Hz EMF using in vitro exposure systems, for 24 h and 72 h –. Untreated cells served as the control. At the end of the period of exposure, MTT (final concentration 5 mg/ml in PBS) was added to each well, and the multiwell plate incubated at 37°C in 5% CO2 for 2 h. The coloured crystals of produced formazan were dissolved in dimethyl sulfoxide (DMSO) (Sigma, USA). The absorbance was measured at 550 nm. Cell proliferation was calculated as the ratio of the absorbance of the treated group, divided by the absorbance of the control group, multiplied by 100, to give percentage of proliferation . For analysis of cell death, we used fluorescent assays AO/EB double staining . AO is taken up by both viable and nonviable cells and emits green fluorescence when it bonds with double stranded nucleic acid (DNA), or red fluorescence if bound to single stranded nucleic acid (RNA). 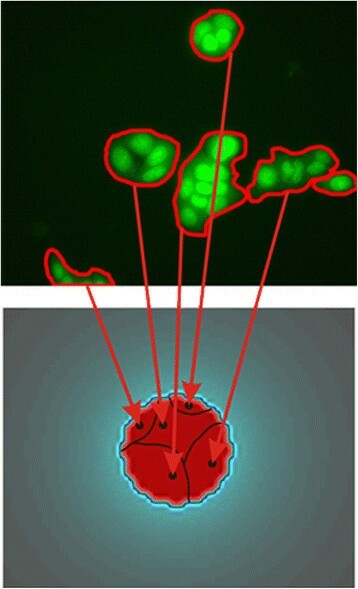 Ethidium Bromide is taken up only by nonviable cells and emits red fluorescence by intercalation with DNA. We distinguished four types of cells according to the fluorescence emission and the morphological aspect of chromatin condensation in the stained nuclei. Viable cells have uniform bright green nuclei with an organized structure. Early apoptotic cells have green nuclei, but perinuclear chromatin condensation is visible as bright green patches or fragments. Late apoptotic cells have orange to red nuclei with condensed or fragmented chromatin. Necrotic cells have uniformly orange to red nuclei with condensed structure. 20 μl of dye mixture (10 μg/ml AO and 10 μg/ml EB in distilled water) was mixed with 100 μl cell suspension (10 000 cells/ml) in a 96-well plate. After incubation times (24 h and 72 h) the suspension was immediately examined and viewed using a Nikon inverted fluorescent microscope (Ti-Eclipse) at 400x magnification. Untreated cells were used as controls. A minimum of 300 cells was counted in each sample. Results were expressed as the Mean ± SE for three independent determinations. Biological activity was the result of one individual experiment, performed in triplicate. Correlation between variables was investigated using a SPSS (Chicago, IL) statistical software package (SPSS for Windows, ver. 17, 2008). where c = c(x, t) is the concentration of tumour cells, D is the spatially constant diffusion coefficient (defining cell migration), ρ is the net rate of cell proliferation and F(t) represents the effect of EMF at time t.
The initial and boundary conditions are set such that at t = 0 the cell concentration is set to c0 and the zero flux is prescribed on the boundary of the observed domain - n ⋅ ∇c = 0. In-house developed software was used for imaging analysis of experimental results (images of cells in 96-well plate obtained during the experiment). All the areas of cells visible on experimental images are summed and the cumulative single cell with the same area created, as shown in Figure 2. The initial cell concentration is determined using this software and images from the beginning of the experiment. The same procedure was used to evaluate the percentage of cells over the whole observed domain after 24h and 72h of cell exposure to EMF. These percentages were later used for parameter estimation. The procedure of creation of a single cumulative cell for the numerical model from experimental images. where parameters a and b have to be estimated. The index “t + Δt” denotes that the quantities in question are calculated at the end of a time step. The matrix M c is the mass matrix, K cc is the diffusion matrix (here are also included the effects of electromagnetic field) and F c is the forcing vector, that takes into account the boundary conditions. The space step for the simulation is 1 μm and the time step in the simulation is 1 min. where A 24 h e and A 72 h e are experimental cell area percentages after 24 and 72 hours. A 24 h s and A 72 h s are cell area percentages obtained with simulation after 24 and 72 hours. The difference between the survival of EMF-exposed cells and control cells, as well as the difference between different cell types was observed. The percentages of cell viability after exposure to EMF are given in Figure 3A and B, respectively. 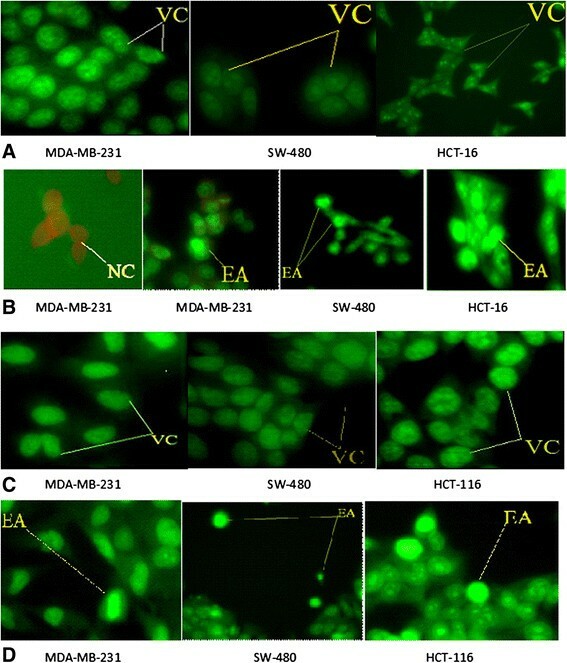 The EMF inhibited cell growth in each of the three investigated cell lines, being very similar between the two colon cancer cell lines (88.53% viable SW480 cells after 24 h, and 94.19% after 72 h, and 98.28% viable HCT-116 cells after 24 h, and 97.20% after 72 h). However, the breast cancer cell line MDA-MB-231 was more sensitive to EMF after both investigated exposure times (inhibition > 50% of MDA-MB-231 cell growth). Only inhibition of the cell growth of treated HCT-116 was not statistically significant in comparison to control HCT-116 cells. Extending the exposure time did not enhance EMF effects. Importantly, higher cell viabilities were observed after 72 h, indicating that EMF had antiproliferative activity which decreased with time. Effects of 50 Hz EMF on the cancel cell after 24h and 72h of exposure. (A) After 24h of exposure. (B) After 72h of exposure. The histogram of effects of 50 Hz EMF on human breast cancer cell line MDA-MB-231 and colon cancer cell lines HCT-116 and SW-480. The antiproliferative effect was measured by MTT assay after 24 h of exposure. All values are mean ± SEM, n = 3, *p < 0.05 as compared with control (100%). To determine the type of cell death induced by EMF in MDA-MB-231, HCT-116 and SW480 cells, the AO/EB method was used. Figure 4(A) and (C) show the intact viable cells (V) and Figure 4(B) and (D) show typical morphological changes after cell exposure to an EM field. After cell exposure to an EMF, cells showed changes in cellular morphology, including reduction in cell volume, chromatin condensation, membrane blebbing, and fragmented nuclei. The AO/EB method was used for differentiation and quantification of viable, apoptotic and necrotic cells. Tables 1 and 2 summarize the results obtained with AO/EB double staining. The percentages of viable, apoptotic and necrotic cells were noted for two incubation periods. Compared with spontaneous apoptosis observed in control cells (Tables 1 and 2), exposure to an EMF resulted in a reduction in the number of viable cells, increased percentages of apoptotic cells in different percentages depending of cell line. Generally, EMF had proapoptotic activity. EMF did not cause necrosis in the investigated colon cancer cell lines or, at the very least, a very small percentage, but it did so in MDA-MB-231 cells (9.68%). Untreated and treated cancer cells with 50 Hz EMF after 24 and 72 h. (A) Untreated cells were observed as control. (B) Treated cells of 50 Hz EMF after 24 h. (C) Untreated cells were observed as control. (D) Treated cells of 50 Hz EMF after 72 h. AO/EB staining of MDA-MB-231, SW-480 and HCT-116 to detect the type of cell death induced by 50 Hz EMF. Magnification on fluorescent microscope was 400×. VC-Viable cells; EA-Early apoptotic cells; LA-Late apoptotic cells; NC-Necrotic cells. n = 3, *p < 0.05 as compared with control. VC-viable cells; EA- early apoptosis; LA-late apoptosis; NC-necrotic cells. Results of the fitting procedure from numerical simulation are given in Tables 3 and 4, respectively (coefficients a and b for the influence of EMF do not exist for control cases in Table 3). The estimated diffusion coefficient is very small, which is in accordance with the fact that cells are practically not migrating throughout the domain. Even with an approximation of a single cumulative cell model, computer results seem very promising. Figure 5 shows the diagram of variation of cell percentages over the whole domain with respect to time. The red line represents the control cancer cell line, where no EMF was applied. The blue line represents the cancer cell line with EMF acting on cells. The black line represents the effect of EMF, which was modelled using the logarithmic function described in equation (2). The results obtained are shown for three different states in time above the diagram in Figure 5. These specific moments in time were chosen because the state of cells during experiments was pictured at these moments and those images are also shown in Figure 5. D = diffusion coefficient; ρ = proliferation rate; a and b = parameters from the logarithmic function in eq. (2). Comparison of experimental and numerical results. The experimental images, obtained numerical results, and diagram of cell percentage variation, with respect to time. In an attempt to explore new avenues of cancer research, we focused on a local treatment with EMF. In contrast to most anticancer agents, EMFs are not associated with any meaningful systemic toxicity –. Furthermore, it was recently shown that EMF may be used clinically, not only as an antiproliferation agent, but also as an effective adjuvant to currently used chemotherapeutic agents. The aim of this study was to investigate the influence of EMF on three cancer cell lines. The analysis was performed in vitro and by computer simulation. After 24 h incubation cells were exposed to 50 Hz radiofrequency EMF using in vitro exposure systems for 24 h and 72 h. We developed a specific reaction-diffusion model with the net rate of cell proliferation and effect of EMF in time. Also, the fitting procedure for estimation of the computer model parameters was applied. The disintegration of cells treated by EMF of 50 Hz frequency compared with untreated control cells was clearly shown. EMF had antiproliferative and proapoptotic activity in varying degrees, depending on the cell lines and time of exposure. The effect can be explained according to two proposed mechanisms : during cytokinesis and during cell division when it interferes with the microtubule spindle polymerization processes. Thus, EMF disrupts the cell structure, inhibits cell division and results in cell death. These results add to the existing knowledge in this field. Following encouraging in vitro and in vivo results , Kirson et al used alternating EMFs in 10 patients with recurrent glioblastoma multiforme. The median time to disease progression was 26.1 weeks (range, 3-124 weeks) and the progression-free survival time at 6 months was 50%. The median overall survival time (MST) was 62.2 weeks at the time of the report (range, 20.3-124 weeks), seemingly an improvement which was more than double when compared to historic controls. No serious adverse events (SAE) were observed, while 9 out of 10 patients experienced mild to moderate (grade 1 and 2, respectively) contact dermatitis beneath the electrode gel, all successfully treated with topical steroid creams and periodic electrode relocation. In an interesting approach, Barbault et al tried to identify tumour-specific frequencies in patients with advanced cancer using a non-invasive biofeedback method to identify such tumour-specific frequencies. In 163 examined patients, a total of 1524 frequencies ranging from 0.1 Hz to 114 KHz were identified. Most frequencies (57-92%) were specific for a single tumour type. Self-administered treatment, three times a day, was offered to 28 patients (26 treated in Switzerland and 2 in Brazil). Thirteen patients were evaluated for response. Both patients with hormone-refractory metastatic breast cancer achieved either a complete response (lasting 11 months), or a partial response (lasting 13.5 months). Four patients had stable disease (SD) (range 4.0 to >34.1 months), while only one patient experienced grade 1 fatigue. The largest study so far has been published by Costa et al with 41 patients having advanced hepatocellular carcinoma treated with low levels of EMF modulated at specific frequencies (27.12 MHz). Three-daily outpatient treatments were administered until disease progression or death. The majority of these patients had either failed standard treatment options or had severely impaired liver function that limited their ability to tolerate any form of systemic or intrahepatic therapy. Fourteen (34.1%) patients had SD for > 6 months. Median progression-free survival was 4.4 months and MST was 6.7 months, with no grade 2-5 treatment-related toxicities observed. This data seems comparable to recent data from other therapies in this setting . Having a long lasting interest in computer modelling, we have developed a model that intends to simulate the influence of EMF on cancer cells. The images of experimental setup were used to create a cumulative single cell for computer simulation. In our approximation, we achieved very good comparison with the in vitro results. However, any computer model used in the clinic must precisely predict tumour size and shape. Future computer models, too, have to predict the changes induced in the host by the growing tumour, and the impact that one or multiple treatment strategies could have on halting tumour progression. Also probably patient specific EMF frequency could be optimised through computer simulation. We choose extremely low frequency 50 Hz from literature , but further research should go in the direction of investigation more frequencies. In addition, we would like to emphasize that the evidence from (only) two different cancer cell lines may well not be enough to infer to conclusions about the effect of EMF in cancer. We plan to use current study findings to upgrade future experiments by addressing two major pathways: one, by considering a certain class of cancers, modulated by the same genes, and two, by using several cell lines, belonging to the same cancer. In the first case, one could prove that EMF may be useful for “similar cancers”, while in the second case one could prove that a specific cancer could be affected by EMF. Based on findings, further in vivo studies would be needed as to bridge the gap towards initial clinical use, by, hopefully, identifying those cancers which may be good target groups in this setting. Results in the current study had been obtained with the use of EMF alone. It is, however, interesting to observe that additional anticancer treatment, namely chemotherapy, can also be added in order to improve treatment results in clinic due to possible synergistic effects. EMF in combination with various chemotherapeutic and targeted agents demonstrated no increase in side effects clinically, while similar findings were reported in vitro ,. Other treatment modalities such as magnetic nano-particles, ultrasound, and/or radiotherapy ,. Of particular importance is the finding of the recent phase III study  in recurrent glioblastoma multiforme which showed efficacy similar to the standard chemotherapy regimen but with fewer adverse effects . The use of similar devices are eagerly awaited to be tested in a number of tumor sites. Findings of the current study seem to reconfirm potential application of EMF in oncology. Computer simulation tools also uncover a new avenue to optimize control of tumour growth and may have broad implications for the treatment of cancer. These results call for additional investigations before being tested in a phase I-II clinical trial. Funded by the Serbian Ministry of Education, Science and Technological Development grants: III41007 and III41010. All authors in this manuscript declare that NO financial and non-financial competing interests exist. NF, TD, MR carried out simulation/modelling studies. DC, MC, SM, AP carried out in vitro experimental studies. NF, SM participated in the design of the study and helped to draft the manuscript. BJ participated in the design of the study and drafted a manuscript. All authors read and approved the final manuscript.